Nice looking stylish maternity patterns and maternity clothing are usually very hard to find – especially if you’re not an “average” size. Petite maternity clothing or plus size maternity clothing are very difficult to match the size you really need. Even if the size is available, how many different “styles” of maternity clothes are available. Pregnant women usually have very little to choose from, and if you’d like to have “modest” styles, there is almost nothing available. Changing regular “store bought” patterns into maternity styles is exactly what it sounds like — take the normal patterns that you like to use, and have on hand and change them so they can be used as maternity patterns. Our practice blouse begins with a simple top that has a back neck zipper closure. This first pattern is using any back zipper closing top that you like to wear. We’re going to add the yoke and fullness to make it into a maternity style. 1. 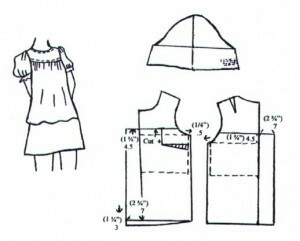 To determine where to begin the “yoke” portion, measure up 4.5 cm (1 3/4″) from the horizontal lower armhole line, as indicated above. 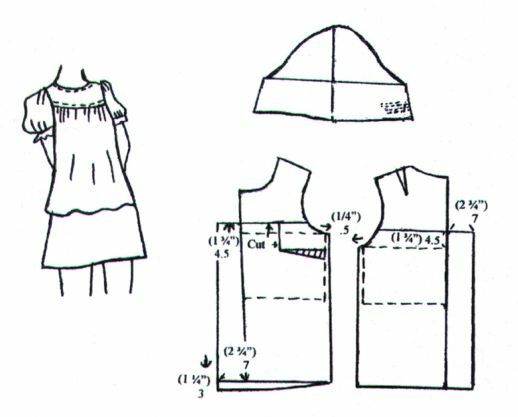 If your blouse pattern doesn’t have a horizontal lower armhole line, simply draw in your own line, then use that line as a guide to position the cutting line for the yoke. Extend the new yoke line 7 cm (2 3/4″) out as shown on both the front and back bodice pieces (this will be the extra allowance for the gathers. 2. At the lower front measure down 3 cm (1 1/4″) to allow for the tummy expansion, and draw in the new slightly curved line. 4. When finished drawing in the new “yoke” line and adjusting the armhole edges, etc, you are ready to cut the paper pattern pieces. After cutting the yoke portion from the remainder of the front bodice, it is necessary to “remove” the dart. 5. On the paper pattern draw a short vertical line from the bust point to the yoke. Next cut the short vertical line to the bust point (this is done on the paper pattern, NOT on the fabric!). Fold the original dart together. 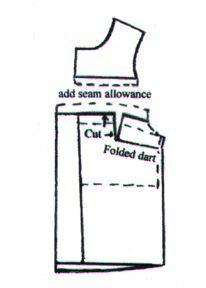 As you fold the original dart, it will spread the “cut” line on the pattern and will get rid of the original dart, as well as make a little extra room for gathers. 6. The back yoke is drawn and cut from the bottom part of the pattern in the same manner as the front. 7. When you pin the pattern pieces to the fabric, be sure to leave enough room between yoke and lower bodice to draw in the new 5/8″ seam lines (shown here with dashed lines). 8. When doing the sewing of the garment, of course you’ll be putting the front pattern piece and the yoke on a fold, and the back yoke and lower pattern piece will be along a selvage edge because of the zipper closure. 9. Pin and sew the front and back lower bodice pieces to the respective yokes, gathering the lower bodice onto the yoke. After this part is finished you can follow the pattern package sewing directions for the remainder of the of the blouse. You can see how easy it is to change a store bought pattern into a maternity blouse. Just a few simple changes to the patterns will give you a huge wardrobe of maternity clothes! In addition, many of the maternity clothes can be changed back into regular clothing after the baby is born! Whether you’re looking for maternity dresses, maternity evening wear, maternity bridal gowns, maternity pants or whatever type of maternity clothes and maternity wear you’d like, this on line downloadable sewing class is all you need to get started on your sewing projects. There are two “converting store bought patterns into maternity styles” classes available – one for the regular S-XL size ranges, and the Full Figure class for those who are 1X – 8X size ranges. The goal of Sewing Business.com is to give information, tips and inspiration to those who have a small to medium size business AND for those who would like to earn a living through their own endeavors. It has come to our attention that we’ve told you how to become an expert in your field and how to have loyal customers, but we’ve neglected to give a basic outline of how to actually start your own home business. It is our desire to help the new home business entrepreneurs get through the “learning curve” with as few mistakes as possible. Even those who have been in a home business for years will pick up some pointers and will say “why didn’t I think of that?”. Here are a few tips that would apply to nearly every home business, whether it’s sewing, crafting, alterations or whatever your interests may be. **Never use “grocery” or “rent” money to begin ANY business. There is no business that can guarantee success, much less “overnight” riches. If you don’t even have the basic $100 or so that many businesses can be started with, we suggest you save amounts of money each week until you do have enough to start. Proceed cautiously and keep in mind that few miracles occur in any business. Rule out luck and use your ability, perseverance and judgment to utilize all attributes of a successful business person. Keep costs at a minimum, use what’s available and keep it simple. **Open a separate business checking account for your new home business. Use this account only for business. This will make your end of year accounting much easier, in addition to knowing immediately what money is coming in and what you can spend on advertising, new products, etc. **When selecting space in your house for an office or work area, keep in mind that the location can have a direct impact on how well you run your business. If you don’t “like” your office you probably will spend as little time as possible there and you certainly won’t get much done! Is the heating and cooling system adequate in your office? If you’ve chosen to put the office in the garage, spring and fall weather might make working conditions okay, but summer heat and winter cold will prevent you from working in your “office” unless you make some changes. If you’re using a spare bedroom, can you arrange things so you can look out the window while you’re on the computer, or have outside lighting while cutting fabric, etc? **If the working area you’ve chosen has limited space (such as a spare small bedroom), it becomes easy to make a “pile” of papers here, a “stack” of letters over there, a separate “pile” of letters to answer later, etc. Eliminate the clutter and take care of work as it comes in — answer the letters immediately, file the papers NOW, open and go through the “stack” of letters you’d saved for “later” – get the table cleaned off! Set a time EACH DAY to take care of the “will get to it later” items – and don’t wait until “later”! **A manila “expando” file is perfect for keeping all your cash and paid-by-check receipts. An expando file sectioned off by “months” will work nicely. You can make labels for the various categories of receipts — Advertising, office supplies, postage, telephone bills, equipment purchase, etc and place the new labels on top of the “month” separation headings. At the end of the year all receipts will already be categorized and ready to be totaled for income tax filing. Oh, yes, speaking of POSTAGE receipts – keep EVERY business related postage receipt, even if it was just for one stamp. You’ll be amazed at how much these add up over a years’ time. **You should be prepared to stay in business for at least a FULL YEAR in order to get things running smoothly and profitably. Give it your all! **The number one reason for business failure is management – or the lack of it. The lack of knowledge, experience, imagination, ambition, preparation, determination, unexpected competition and a waning of motivation. Eliminate as many entrepreneurial risks as possible at the beginning – know what you want and be determined to go for it! **Enthusiasm is contagious. Choosing to look at the world with enthusiasm, confidence and a sense of humor is a choice YOU must make. Avoid pessimists – they can poison life and your outlook on life! **THOUGHTS determine what you want… ACTION determines what you get!! Lastly, and this little tidbit is free — it’s amazing how much more can be accomplished in a day if you get up 30 minutes earlier than usual! That’s for early risers like me, my daughter would say “if you stay up 30 minutes LATER than usual”. Whichever works for you, the extra 30 minutes x 365 days makes all the difference in how committed you are to making your home business work! Do you tremble a bit when a customer brings in stripes or plaids for you to work with? Are you a little uneasy and just “hope” you’ll be able to do a good job? Plaids and stripes are not that difficult to work with when you know a few rules, and most especially if you can make up a chart for your customers to educate them about “even” and “uneven” stripes or to make them aware of whether the stripes on a piece of fabric runs “lengthwise”, “crosswise” or “diagonally”. Following are some hints and pointers regarding stripes and plaids that must be taken into account as you prepare the fabric for cutting. **Stripes can run lengthwise, crosswise or diagonally. To test lengthwise stripes – make a lengthwise fold, right sides of fabric together; turn back one corner to form a right anged fold — EVEN stripes will match along the angle in width, color and sequence; UNEVEN stripes will not match in all three respects. **In nearly the same way, test cross-wise stripes by folding the fabric CROSSWISE and turn back a right angle corner – check for a match. **Test diagonally striped fabric by placing the fabric with (unfolded) surface right side up; for diagonals running from upper left to lower right, turn back a lower left hand corner; for diagonals running the opposite direction, turn back the lower right hand corner – check for match in all respects. **EVEN stripes are easiest to work with and can meet to form a chevron “V” without difficulty. UNEVEN lengthwise stripes will chevron only if the fabric is reversaible. UNEVEN cross-wise stripes will chevron on shaped, curved or bias seams. **PLAIDS require more careful scrutiny. Fold a plaid in the same way as a lengthwise stripe, but examine the outside edges of the folded corner, as well as the angle. Everything must match, in all directions. **When purchasing plaid fabric, always buy half a yard extra to allow for matching. Then plan how the plaid or stripe should run. Do you want the main lines to run bias, across or up and down. If the fabric pattern is bold and large, more care is required than for a smaller stripe or plaid. **Stripes and plaids cannot match in every area, so give priority to side, front armhole and waist seams, or to points where an upper and lower garment meet. **Make all pattern alterations before laying them on the fabric. Cut out even stripes and plaids on pinned double layers, if desired, but cut uneven ones singly and use them with the “with nap” pattern layout. The extra precaution taken at the beginning of the project will be well worth the effort as your customer proudly shows off the completed garment. ANNOUNCING Sewing Machine Repair For The Home Sewer in Spanish! 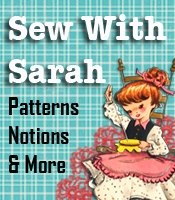 If you or anybody you know speaks Spanish, you will be happy to know that SewWithSarah.com now has their best seller, Sewing Machine Repair for the Home Sewer in Spanish!